A similar jar and cover is in the Burghley House collection, illustrated in The Burghley Porcelains, no. 74 and M. Hinton, O. Impey, Kakiemon, Flowers of Fire, no. 11. Another is illustrated in Soame Jenyns Japanese Porcelain, no. 54a, where it mentions that another piece in Japan is described as "probably by Kakiemon I", who died in 1666. 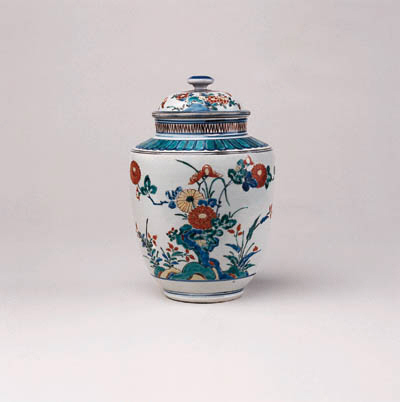 A similar jar is in the collection of the Museum of Fine Arts, Boston and another in The Avery Brundage Collection in San Francisco.